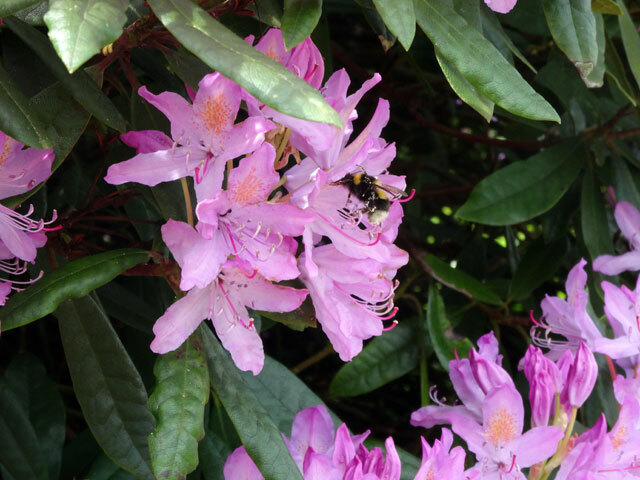 While I was at Gavinton Church this morning I took this picture of a bumble bee hard at work on the flowers in the church yard. Bees were in my mind because earlier Tom had telephoned to say that he and Dorothy had extracted eighteen pounds of honey from one of their hives – and I gather that there is more to come. Haven’t they – or their bees – done well? Up early for a Saturday and walked Mix before an early breakfast. Then Rachel and I drove Cathy to Berwick and set her off on her journey to Luss by bus (and, using her pass, at no cost at all). The bus was empty, well Berwick is the terminus, and it looked extremely comfortable. Before coming home we went to the retail park where I bought a strimmer to tackle some of our long grass. We have great plans for the different areas of green but with all of the building programme the grass has so far been neglected. Back home I got a phone call from Ann to say that her printer was on the blink and so she was going down to the church where there was a photocopier which might or might not be functioning. I said that I would drive over and join her and while I waited for her I took the picture at the head of this entry. The photocopier wasn’t functioning – with help from Helen it looked as though it might but that hope proved to be a vain one. As I drove back from Gavinton I had a picture in my mind of people all over Scotland in churches trying to get broken equipment to work. I have certainly spent a great deal of time trying to nudge printers and photocopiers and almost every piece of equipment you could imagine back into life in the hope that I might get just a little bit longer from them. Rachel set off for the hills to walk Rowan, Mix and I set about assembling the strimmer. However, no sooner had we completed the task than it started to rain, ruling out grass cutting for the afternoon. So I made myself some lunch and retired to the summer house where I watched the final of the ladies singles from the French Open. It was a magnificent match with Maria Sharapova edging out a very plucky Simone Halep over three sets. During the afternoon I got a visit from Helen who was taken, I think, by the opulence of my ‘garden shed’. Rachel returned as Helen arrived so we were able to show her the new Loom Room before she set off for home. I listened to the end of Durham’s T20 match against Worcester (at Worcester). From a position where I thought that they couldn’t lose, Durham managed to get comprehensively defeated. Digger has been out and about today. He and Olive watch a web-site which seems to be a channel for people to give to other people things for which they no longer have a need. Today Digger was away at Eyemouth to liberate an unwanted greenhouse. But it turned out to be a bigger exercise than he had imagined. Aluminium nuts and bolts were continually sheering as he was trying to un-fix them, and the whole structure was extremely hard to get at. So for Digger it will be back to Eyemouth tomorrow but if he gets a greenhouse out of it, he will have done well -- and the cause of recycling will have been boosted as well. I fed Mix and we went for supper at the farmhouse after which we watched two concluding episodes to series we had been watching and had recorded during the week – From Then to Now and Happy Valley. I enjoyed them both. Happy Valley ended as I had expected but I was captivated by the performance of Sarah Lancaster; From Then to Now was so different and quite unexpected and I loved it. Walked Mix and went to bed. It has been yet another great day.